The first milk produced by the mother is called COLOSTRUM. This is thick and creamy milk that contains antibodies. In the first 24 to 36 hours of life young animals can absorb these antibodies directly (instead of digesting them like a protein would normally be). In this way immunity is passed from the mother to her offspring. It is VERY important that newborn animals ingest colostrum. If they do not, their chances of survival are dramatically decreased as they have inadequate resistance to infections. Colostrum intake is possibly the single most important factor in animal neonatal survival. Very young animals may require feeding as often as every two hours. Newborn animals are very small and so their body reserves for energy are not well established. If food is not given frequently enough they can become hypoglycaemic (low blood sugar levels) and die. Some animals are able to suckle from a bottle and milk formula can be fed in this way. Sometimes the young animals are too weak to suckle, and so milk must be fed via a stomach tube. If it looks as if your young animal is not suckling vigorously then it is important to take it to the vet. It is not advisable to use a syringe for feeding, as this can increase the chances of spraying too much milk into the mouth. 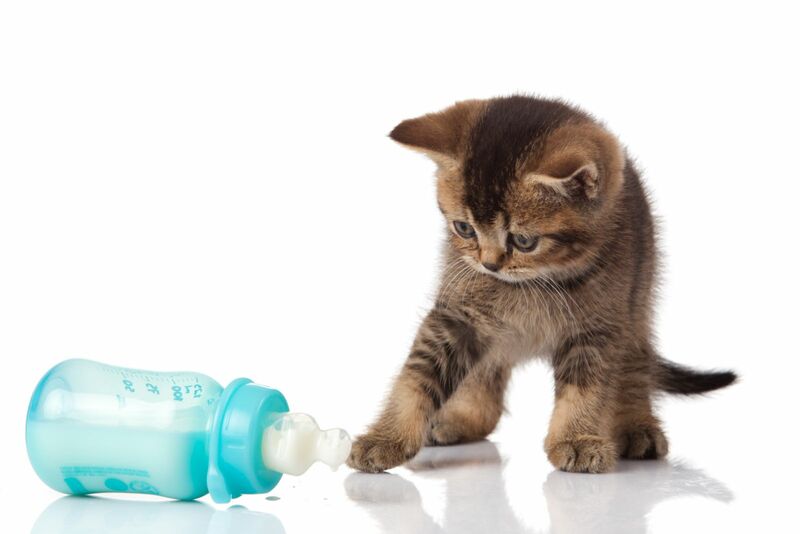 The same problem can also occur if the hole in the bottle teat is too large; or if the bottle is held at too much of an upward angle during feeding (it should be held only slightly higher than horisontal). When too much milk is in the animal’s mouth, the milk can go down the windpipe to the lungs, instead of down the oesophagus to the stomach, and cause pneumonia or inflammation and infection of the lungs. This lowers oxygen intake and decreases the young animal’s chances of survival. To encourage suckling the teat can be held against the top of the animal’s mouth and then gently pulled backwards. This action stimulates the suckling reflex, and can be helpful if the suckling is very sluggish. Milk formula is preferable to cow’s milk, because the milk for kittens and puppies should be higher in protein and fat than that which is produced for a calf. The milk formulae are made specifically for different species, as kittens and puppies have slightly different nutritional requirements. In the case of young rabbits, it is advised that kitten formula be used as it is richer, and more appropriate for this species than puppy formula. If no formula is available you can feed a homemade mixture made up of equal quantities of full cream dairy milk and egg yolk. It is important not to include the egg white as it causes a runny tummy (diarrhoea). It is important that the milk fed is given at body temperature, because food at the wrong temperature can also cause digestive upsets. It is advisable to boil the bottle and teat in water for a few minutes between every use to keep them as clean as possible. The stomach capacity in puppies less than two weeks old is only about five ml per 100 grams of body weight. Therefore each feed should not exceed this amount or it will be more than the puppy can handle. The amount that young puppies require per day is about 20 ml per 100 grams of body mass in the first week; and 23 ml per 100 grams of body mass in the second week. This amount increases gradually every week. Young animals can become dehydrated quickly, and a small amount of weight loss is significant. If a puppy loses ten percent of its birth weight in the first week of life then its chances of survival decrease. For this reason it is vital to get the young animal to the vet if it looks as if it is not eating properly; or if it is crying excessively; or showing signs of an upset tummy. The small body size of newborn animals predisposes them to becoming cold. Besides this, they are not yet able to regulate their own temperature (this only begins at two to three weeks of age). It is necessary to provide a source of warmth that they can move closer to if they are cold, and move away from if they become too hot. A sign of cold puppies is when they huddle closely together, whereas puppies that lie far apart may be too hot. The ideal temperature for puppies and kittens in the first week of life is 29 - 31?C. In the second week this drops to 26-28?C, and continues to drop gradually as they grow older. Young animals must be kept out of draughts and if possible the air kept quite humid. This can be achieved by placing shallow pans of water around the area where the animals are kept. Another important consideration when hand rearing young animals, is that they are unable to urinate and defecate without stimulation for the first three weeks of life. In nature a good mother will lick her offspring’s genital area, and other puppies may try to suckle here, which helps the puppy or kitten to pass stools (faeces) or urinate. Without these measures it is necessary to gently wipe the area under the tail and between the back legs with a piece of wet cotton wool. It is also advisable to hold the animal upright after feeding and stroke the back to encourage burping, as with a human baby. It is clear that hand rearing a young animal requires a large amount of commitment and time, and even with the best care, survival of the initial period is not always possible. If you are concerned about your puppy or kitten it is important to consult the veterinarian sooner rather than later, as their resilience is less than an adult’s. Finally, once the animal has gotten through the critical period and is eating successfully on its own, the next concern is ensuring adequate socialisation. The hand reared animal is not exposed to the natural environment of parents and siblings where hierarchies are established and normal behavior instilled, so extra care must be taken to ensure that your pet becomes a confident and well balanced survivor.